The Middle Fork of the American is upstream of its confluence with the North Fork American. It is a dam-controlled river, which means you can expect reliable water all season long–typically late spring or early summer through the mid to late fall. Higher flows in the spring can delay the start of the commercial rafting season and private boaters should be sure to check flows to make sure they are aware of current conditions. 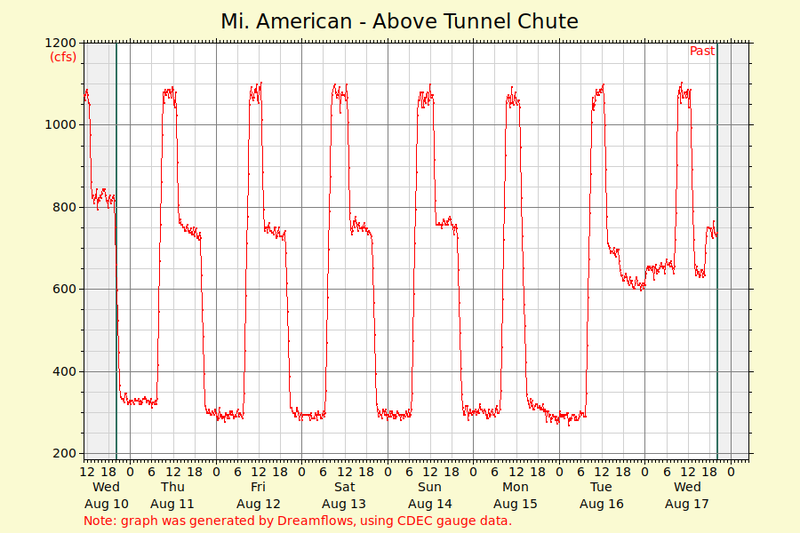 Releases are regulated so Private Boaters should plan on getting on the water by 10 am and check Dreamflows to be sure. The controversial Auburn Dam project would have flooded the raftable section of the river but legal decisions in the fall of 2008 made it highly unlikely the dam will ever be built. However, dam supporters are well-known to be tenacious, so who knows what will happen in the future. For now, private and commercial boating on the Middle Fork American seems secure. The Foresthill Bridge, which crosses the North Fork of the American near the confluence with the Middle Fork, is the 3rd highest bridge in the U.S. at 730 feet above the river canyon. It was originally built to cross over the proposed Auburn Lake, but the Auburn Dam project was officially abandoned.